!!! SPECIAL OFFER JANUARY AND FEBRUARY !!! Outdoor Floor 1 140 mtrs in 1886 restored listed building with lift. And our floor has differences of others, it is the only building with a gazebo iron street you liked, and the only one with a historical background to tell you. We have a quiet and interior BLUE ROOM with very good ventilation overlooking the courtyard with plants and a very large to store your stuff comfortably with double bed, digital TV and WIFI high speed .We one TRIPLE ROOM quiet and very spacious closet with very good ventilation overlooking the Fuencarral street with plants in their only iron gazebo with a new comfortable sofa bed with mattress 140x194 and a single bed 90 cm with digital TV and WIFI high speed , record player with vinyl records and radio and DVD. Ideal for a couple with young children, where if you have a baby will prepare a crib in the same room. With two private bathrooms, no en suite. Have lots of privacy. If you are two or three triple ye adapted to take another space, lounge. But the house is spacious for this top five that I might as together at home. We supply you need for a comfortable stay, we have linen and towels for you, whether as toiletries and hair dryers. We invite you to a light breakfast, usually tea or coffee, cereal, fruit juice. The kitchen is so spacious and rustic and functional while going to enjoy after your walks around the city. We give a map of the city, some guidance, tips sights and suggestions on how to make the most of your stay. We have a small library with books on Spain and Madrid from which you can use during your visit. Dictionaries English, French and Italian. You will have your guestbook so you tell us your experience. If you want to shuttle to the airport they charge 30 euros for less than five people, and for five or more, 40 euros, check availability. If you need to park your car, we have a garage nearby, you must tell us how long you're staying in, to tell availability and price is 20 in public charge 30 €, depending on length of stay. Guests have access to all areas and services of the house, have access to an office for those wanting to work or check your computer, or need to use the office with guest access. We like to have attended the guest at any time may require any information, we like those guests goodbye and leave your experience in the guestbook of the house. We are located in the center of Madrid itself, on Calle Fuencarral in its pedestrian stretch very fashionable, busy yet peaceful and very safe, so close to the Gran Vía (one of the main avenues, reminds me of London). In the entertainment area. The best area of ​​the neighborhood. It's like the New York Soho. In the historical district and close to major monuments, the most important art museums (El Prado, Thyssen, Reina Sofia), shops, restaurants, bars, on the same street, nightclubs nearby, supermarkets, cinemas in the same Fuencarral street , theaters, botanical gardens, Retiro park, amusement park, the trail. Have ALL hand. No need to take transportation to visit the main points of cultural tourist attractions, you can walk everywhere. You'll thank. With several bus and subway lines, the closest stations are Gran Vía, Tribunal and Chueca. Have tourist bus stops nearby, in Gran Vía. But I recommend exercise. Cities are to live them. You have metro from the airport to stop Court and takes about 40 minutes. Have near the train station (Atocha, Principe Pio) or bus (station Méndez Álvaro), if you want to visit other nearby places like Toledo, Cuenca, Segovia, El Escorial, La Sierra de Navacerrada. With the restoration of the house we plan to maintain the high ceilings and wooden pillars discover. In the kitchen and one bathroom we discovered in the upper brickwork and beamed ceiling in the kitchen, these elements have in the structure of these houses of 1800. In the bathroom 1 you have a sink and a large tub with a large window overlooking the courtyard. In the bathroom you have two sinks with window to the inner courtyard. Very accommodating landlord and a great property and location. Our family of 3 had a great time in Madrid thanks to this property. This is so close to all the important areas in Madrid and also to the Metro. Furnished very well and has a lot of space. Most importantly, the apartment has a lovely, authentic feel. Alejandro is quite friendly and was very welcoming from the start - arranging for our pickup from the airport, answering queries, providing advice on activities, being flexible with the checkout times etc. Highly recommend it to anyone wanting to stay in Madrid! Had a great stay in Madrid at the apartment , it was spacious and classy with exposed timber and old school vibe . Saved a bunch with the full kitchen also .A good time . Thanks again Brett and daughter A.J. Cheers ! The apartment was in a great location allowing us to walk everywhere for all our sightseeing. The apartment was massive, well furnished and equipped and the two bathrooms came in handy. The surrounding area was lively and full of excellent places to eat and drink. We really enjoyed our time at the aprtment and in Madrid. This is a lovely updated historical apartment located within walking distance to all the sights. Freshly painted and with high ceilings it feels spacious despite the fact that there is a lot of furniture. There are 2 metro stations and supermarkets close by. Alejandro is very friendly, warm and welcoming. He was there to meet us, show us around the apartment and give us a detailed overview of the city. 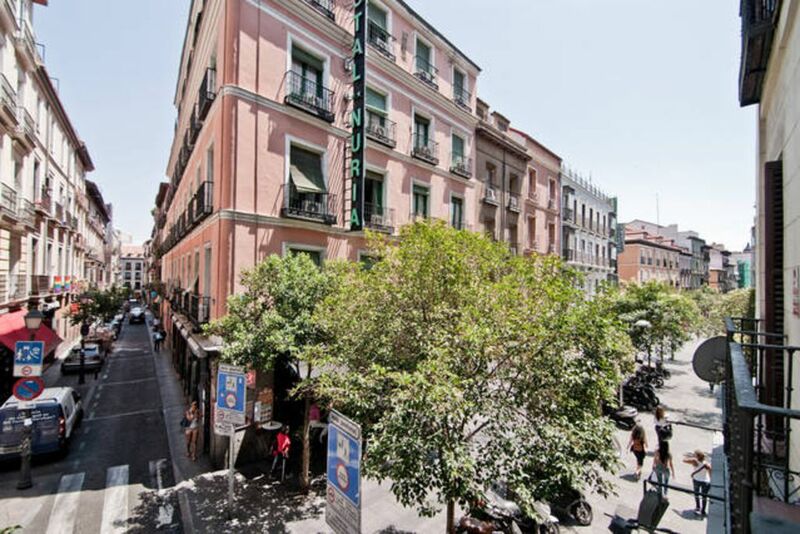 The property is located in perhaps the best location for those looking to walk and see Madrid City Center, the apartment is located in a pedestrian avenue, plenty of stores and restaurants, when we were there the city was packed with people just having fun, it was great people watching! Our Host Alejandro could not have been nicer and attentive, We highly recommend it. Las tarifas no se aplican para niños de 0-2 años ,pues se dispone de dos cunas gratuitas para ellos.